Opening times Mon–Fri 9am–5.30pm; Sat 9am–5pm. Closed Sun. Grown out of the productive efforts of a diverse and vibrant community, Loch Arthur Creamery is a Camphill Community and social enterprise, inclusive of people with learning disabilities and committed to creating meaningful work. 75 people now live in Loch Arthur households, 30 in supported tenancies, and the 500 acre farm is home to a bakery, veg garden, wood and weaving workshops as well as the creamery. From humble beginnings in 1984 using the milk from their two Jersey and two Ayrshire cows, their range of cheeses has become recognised and sought after. Awards and accolades have been won in some of the UK's top competitions every year since 1991, including the Radio 4 Food & Farming award for Best Food Producer 2011. 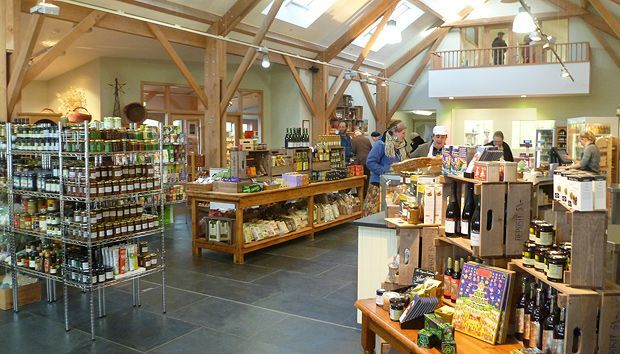 A large, sustainably-built farm shop and café opened in November 2012, and sells their cheeses, yoghurts, meat and baking. It has an onsite butchery with viewing window, organic fruit and veg from the farm and further afield, ecological products and a range of food wide enough to make it easily viable for your weekly shop. Everything stocked must claim one or more of manager Barry Graham's essential qualities: local, connected to Loch Arthur, sustainable, fair trade or organic. The shop is unique in being not only a social enterprise, but all for making or growing all its own main food lines. Their cheese is also sold in shops throughout the UK, and available via mail order. It’s perfectly possible to ﬁll your cheese board with Scottish artisan cheeses. The Larder has teamed up with Pierre Leger of respected cheese retailer and wholesaler Clarks Speciality Foods to assemble some of the country’s prime cuts. Looking for events in Beeswing?